Number of the week: How many Russians see the fall of the USSR as a tragedy? 41% of Russians see the putsch of August 1991, which ended with the collapse of the USSR, as a tragic event for the country, reports independent Russian poll agency Levada Center.The figure is 14% more than in 1994, when the majority characterized the coup as “just a fight for power” Today only 10% of those interviewed see it as a victory for democracy37% of modern Russians think the country started to go the wrong way in 1991.In this photo a monument to Felix Dzerzhinsky, chairman of the All-Russian Extraordinary Committee (VChK) - a precursor to the KGB - is seen being dismantled during a rally in Lubyanka Square on the night from August 22 to 23, 1991. Photo by TASS / Andrei Solovyov; Gennady KhamelyaninRead more: 25 years of post-Soviet Russia: How far has the country come? 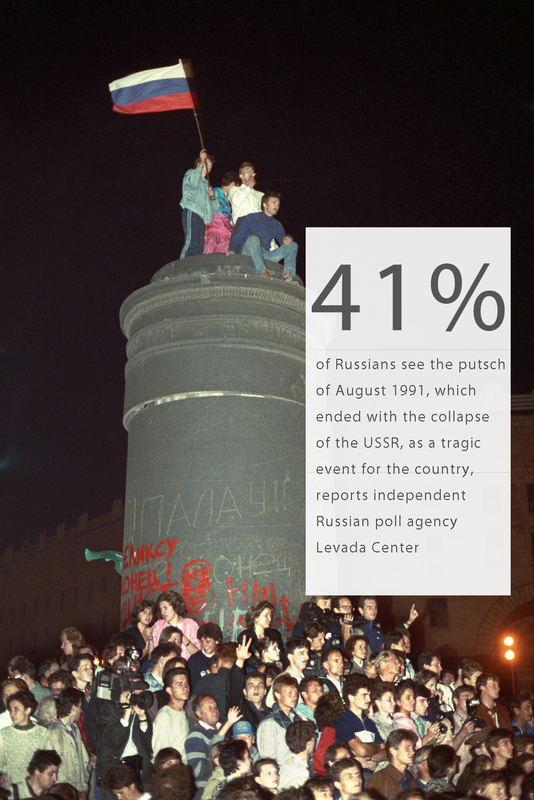 41% of Russians see the putsch of August 1991, which ended with the collapse of the USSR, as a tragic event for the country, reports independent Russian poll agency Levada Center. 37% of modern Russians think the country started to go the wrong way in 1991. Read more: 25 years of post-Soviet Russia: How far has the country come?